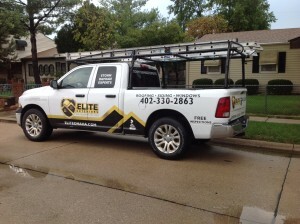 Elite Exteriors has been serving the Omaha, NE, area for more than 20 years, completing a wide range of home renovation services including storm damage repair. If your home has sustained damage in a recent tornado, hailstorm, or windstorm, our team is here to help. We offer various payment options to meet your needs. When you contact Elite Exteriors for storm damage repair services, we’ll send a storm restoration specialist to your home to perform an inspection. They’ll take photos, assess the damage, and draft a scope-of-work report outlining the repairs that will need to be made in order to restore your home to pre-loss condition. Our storm restoration specialists are well-versed in local building codes and manufacturer specification requirements, and they are trained to spot damage that is often overlooked. There’s no job too big or small for the team at Elite Exteriors. When you partner with us for storm damage repair we will have your home looking like new, but we’ll work with you to make sure the restoration process is as stress-free as possible. For more information on the storm damage repair services we provide throughout the Omaha, NE, area, or to schedule an inspection with one of our storm restoration specialists, contact Elite Exteriors today.